Hi students, parents, and friends! 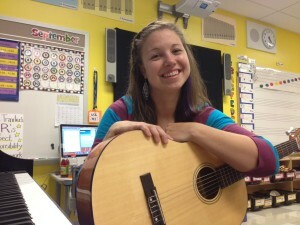 My name is Katie Traxler, and I teach elementary music at PS51 Elias Howe, a public school in Manhattan, NY. In addition to my weekly Pre-K through 5th grade music classes, I also teach chorus, two recorder ensembles, an Orff ensemble, and guitar and ukulele classes. I help manage and support our after school youth orchestra violin and cello classes through the Orchestra of St. Luke’s and our music theater and piano programs through the Council for Living Music. Committed to collaboration among the arts, I work closely with our visual arts teacher, Shani Perez, and our dance teacher, Elizabeth Portnoy, to maintain an arts rich curriculum integrating music, movement, drama, and visual art across all grade levels. Glad you came to visit my website. There are different menus above depending on if you are visiting as a fellow educator, a PS 51 Parent, or one of my many fabulous little musicians! Links to my YouTube channel, Flickr photostream, and our Donors Choose pages can be found at the upper right corner. Hope you find something to enjoy! If you are NEW to PS 51, please sign and return the Media Consent Form to Mrs. Traxler ASAP! Our 2nd grade class 2-402, with the help of our dear friend Emily Eagen, wrote an amazing freedom song as part of the Musical Explorers program this year. Their song was chosen among many submissions to be featured at the A Time Like This concert in March. It was an unforgettable experience for these little musicians to sing THEIR SONG on stage with a band and a chorus for the whole world to hear their voices. As a teacher, it was the chance of a lifetime to be able to give them these memories. It was definitely one of the most gratifying moments of my career. Special thanks to our second grade teachers Suhna and Erica (and Ms. Corona) for their support extending this project into their classroom work. Opportunities like this are what MUSIC EDUCATION is all about!